Happy Easter from us all at Darrynane! 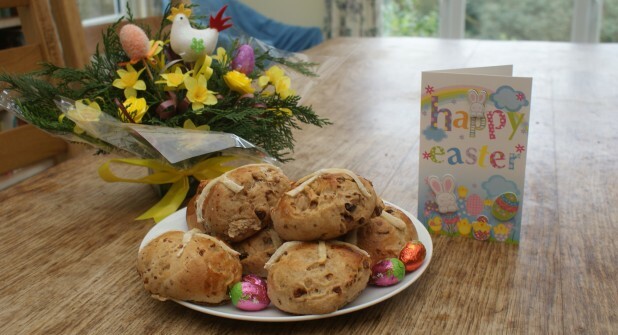 A plate of Hot Cross Buns baked today! Well it’s a few weeks since my last post – I really don’t know where the time has gone. It has been very exciting for Cornwall and Bodmin Moor with the start of the Poldark series and of course the eclipse. 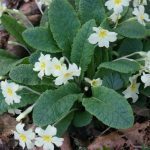 We’ve also had froggy visitors in the pond for the last couple of months and the garden is now Springified with daffodils, Camellia, tulips, primula and not to forget primroses scattered around giving much colour. 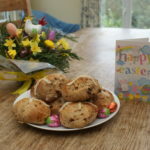 As regular guest know they normally enjoy a Cornish cream tea on arrival at Darrynane but for this Easter I’ve made Hot Cross buns – so I hope they’re just as popular. 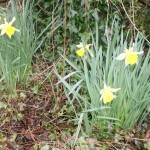 Lovely daffs scattered around the garden. The Poldark series started on BBC1 a few weeks ago. 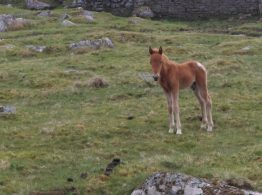 We watch it being film last year by Ivy on Bodmin Moor – the house used for Captain Poldark’s home. We also recognise a few faces who have been cast as extras. Unlike other recent remakes much of is is filmed in Cornwall and shows the true beauty of Bodmin moor and the Cornish coastline. We’re hoping for another series. Doc Martin is also making another series in Port Isaac over the Summer and David and Ameisha went along to audition for extras places. They need at least 200 people for the series, so perhaps they will have a chance. Ameisha has been offered extras work this year, unfortunately due to college and her A Levels she has been unable to take it up – hopefully more will be available after June. The eclipse appeared in our skies Friday morning 20th March. We didn’t think we would be able to see it as we had a very busy changeover day. But the sun rose above the trees in time for us to get a glimpse. David played with various card and hey presto it was there. A local friend found herself on the moor and managed to get a very good view. Like the last eclipse in 1999 the sky darkened and it went quite cold,but unlike last time it warmed up quite quickly afterwards – a special experience. The frogs appeared in our pond at the end of January much to my dismay as the weather turned cold the following week and the pond froze. But all was not lost as they reappeared after the thaw and stayed until mid March. The pond is now wriggling with tiny tadpoles. Not only did we have the most frogs we have seen for many years but the longest time they have stay. 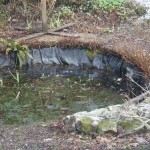 We are hoping for a bumper crop of frogs to frequent the garden shortly. Frogs sunning themselves in the afternoon sun – not very easy to get a good shot. 22nd March we went to the Cornish Arms at St Merryn to Rick Stein’s Beer & Mussel festival. The two days celebrate the end of the mussel season. It was a really good afternoon of music, food, beer and cider not that I sampled the later two as I was driving. We’ve already diary dated for next year and have family booked to visit too. 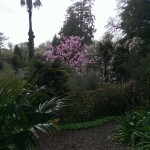 We spent a very enjoyable afternoon at Heligan Gardens last Saturday. The weather dried up for our walk and even the sun appeared for a short time. The Camellias were beautiful with many different shades and flowers. A few Rhododendrons were showing providing even more colour to the gardens with various reds, whites and yellows – lovely. It always inspires me when I go there getting ideas for our garden at Darrynane. We finished off with a delicious tea with a variety of cakes – well worth a visit. A view from the lost gardens of Heligan. The Old Inn, the local pub, is thriving again since Darren’s return. The pub quiz has always been one of our favourite events and it is now even better as Roger, one of our locals, has taken it on. It is so funny it makes a good evening really special. Well, the weekend is very nearly upon us and it just leaves me enough time to wish you all a very Happy Easter.